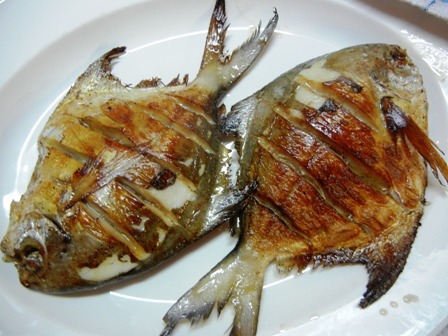 Pomfret, or Bawal Putih, as we call it in Indonesia, is a wonderful fish; in fact it is one of my favourites. I also love “fish-Sundays” which always lends itself to a beautiful white wine. 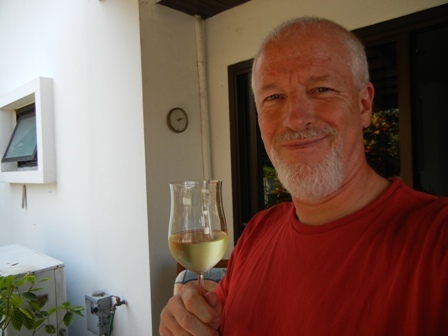 Mind you, I also drink red wine with fish, but if I have some Riesling in my fridge…. 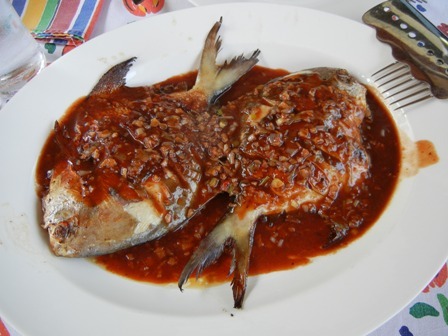 With the chilli-garlic-ginger sauce, the pomfret was just wonderful. From the outset, I was clear about the wine. Well, actually our wine fridge is quite empty. But from my last trip to Germany in November last year, I brought with me two bottles of precious liquid: Riesling wines from my beloved Mosel river. You might guess it, yes. I opened a bottle of ‘2009 Dhron Hofberg GG Riesling’ by Grans-Fassian Estate in Leiwen, Mosel. This grand cru (or Grosses Gewaechs as the German call it) is just wonderful. Wine tastings last year by Weinwelt, a German wine magazine, awarded it with 95 Parker points. The wine is luscious and complex, with beautiful peach and citrus aromas. It has the minerality of the Mosel Riesling. The fine acids and the balance of the wine are just mind blowing. Wine prices in Bangkok are astronomical. For a 5 EURO wine in Germany one has to fork out about 20-30 EURO here. You can have the Dhron Hofberg Riesling for a price below 20 EURO from the cellar door. The trip is worth it. Leiwen is a treasure trove for wine lovers and Riesling geeks. 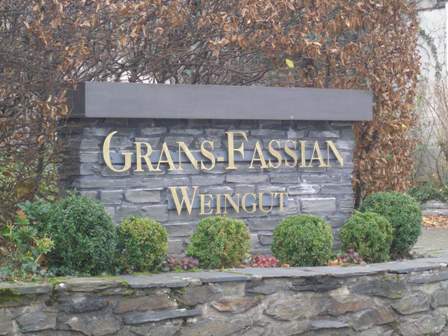 I wrote about the Grans-Fassian Estate in an earlier blog entry. 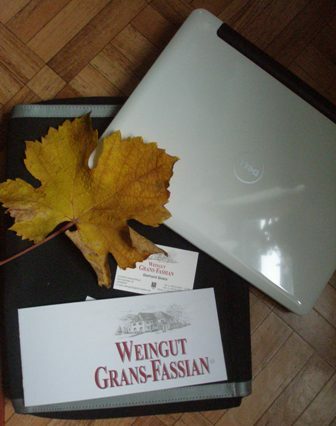 The winery is also member in the prestigious VDP (the Association of German Quality Wine Estates). Openng hours: Mon. to Fri. 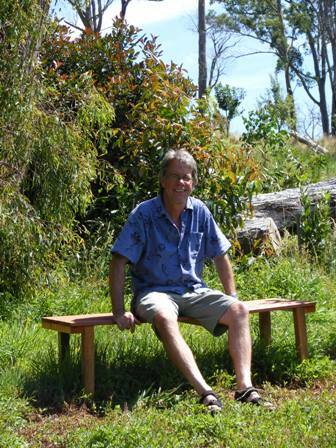 Since quite some time I was contemplating about a garden bench but never found the time to build one. During the last holidays at the vineyard I finally succeeded. It was one of these summer projects of a paper pusher. I learned a lot. First, I should have made a drawing of my bench before starting to work on it. 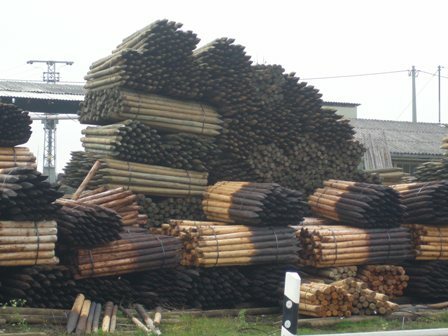 Second, there is room for change even if you have no or an unclear plan. Third, I am not very clever. Fourth, I still succeeded and will make a better one next time, promise (maybe with a back rest). 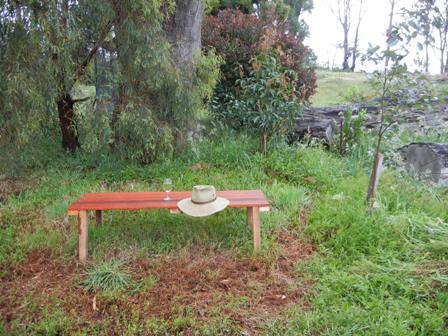 And here it is: my bench, a very simple one, but good enough for resting a few minutes and enjoying a glass of wine. It attracts the first visitor: Thank’s Michael for sitting on my bench and for the photo. On a cools summers’ night, red wine is my wine of choice. 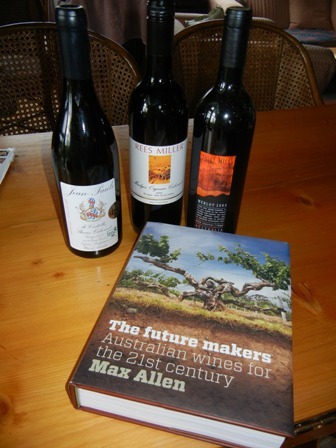 We had bought half a dozen of reds offered by Sevenhill Cellars through the Family and Friends Wine scheme (we had bought white wines too). 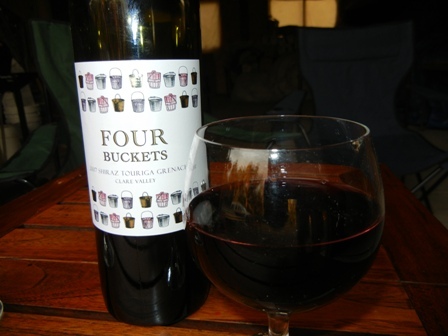 The stylish 2007 blend of Shiraz, Touriga and Grenache called “Four Buckets” is a very nice wine. It goes with and without food. We had it after dinner to enrich our evening when we were sitting in front of our shed enjoying the sunset. The blend is rich and luscious. 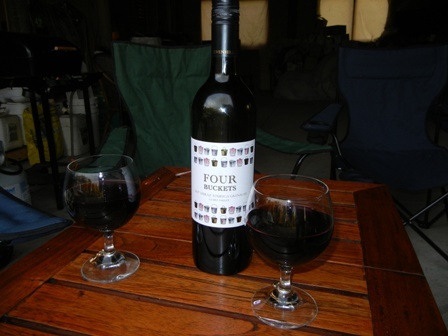 Lots of red berries, full bodied with a good structure and a long finish. We loved the wine. It made our evening. Look out for it. You might download the order form from the internet and send it to the winery. 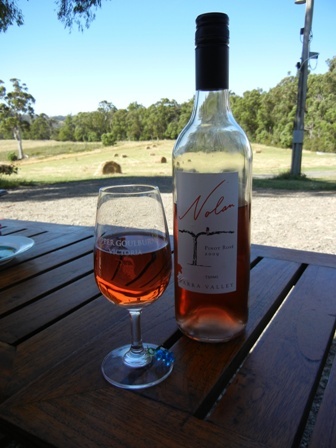 Rosé is always a nice wine for the hot summers days. 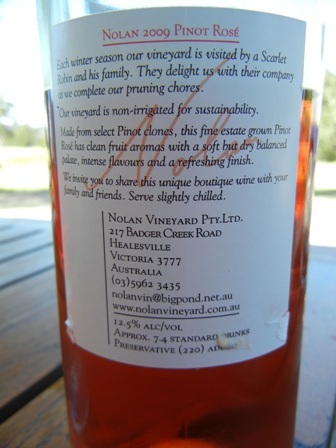 We had the chance to taste the ‘2009 Pinot Rosé‘ from Nolan Vineyard, near Badger Creek in Healesville, Yarra Valley. John and Myrtle Nolan are passionate about their wines. With 2 ha under vines Nolan Vineyard is a so called boutique vineyard. The site at the bottom of the valley is very cold. The vineyard is non-irrigated. The wine has a salamon-pink colour. It is a luscious wine with strawberry aromas and a hint of lemon and honey. It is a truly refreshing drink, enjoyed with or withour food. 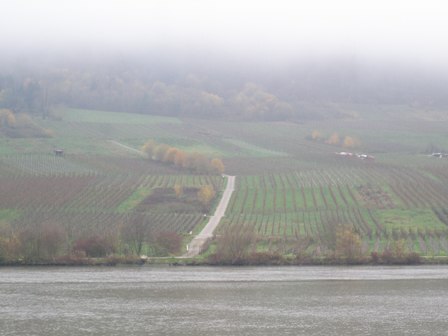 When I drove along the Mosel on a grey Saturday morning last November, I was heading to Leiwen to buy some good Riesling wines. There were three reasons for this trip. It all started at Frankfurt airport when I bought the December issue of “Weinwelt” (World of Wine), the German wine magazine. 1. 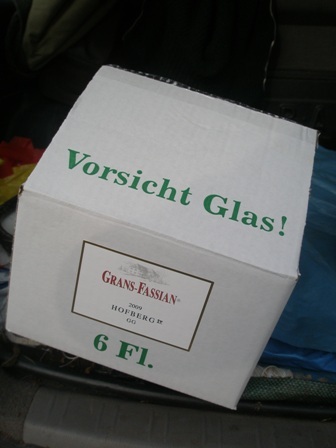 I had looked at the results of a wine tasting of grand cru (GG = Grosses Gewaechs) Rieslings: two of the top wines from the Mosel came from Leiwen; one of them was a ‘2009 Dhroner Hofberg’ by Grans-Fassian Estate. 2. Leiwen is just a 30 minutes drive from my mothers home in Trier at one of the most beautiful bights of my beloved Mosel. 3. I love German Riesling especially if it comes from the Mosel river and I wanted to know what a 95 point wine would taste like. So off I went by car and cruised along down the Mosel. I was lucky, the cellar door was open. Here I met Catherina, one of the two daughters of the owner, Gerhard Grans who had taken over the estate from his father Matthias in 1982. We had a bit of a chat about wine, life and the universe. Catherina is a charming young lady. She is going to be an oenology student at Geisenheim soon. I tasted two of the wines (the ones mentioned in the magazine): the ‘2009 Riesling Dhroner Hofberg’ (95 points) and the ‘2009 Riesling Leiwener Laurentiuslay’ (92 points). I tell you these are Rieslings how I like them. Wonderful wines indeed. Tropical fruit the first wine, and a kind of a citrus bomb the second. Both with a good structure, young, minerally, powerful with a long finish. 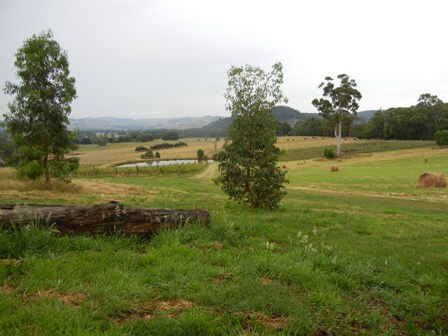 Furthermore, I learned that the estate has about 10 ha under vines. 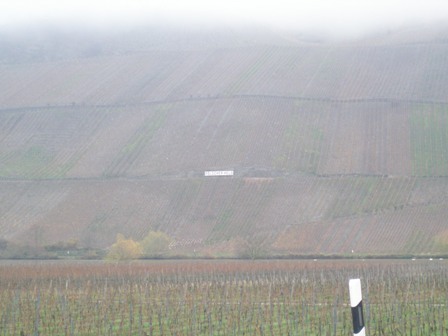 Some of the vineyards are lokated in the best terroir of the region, for instance Dhroner Hofberg, Leiwener Laurentiuslay, Piesporter Goldtroepfchen, and Trittenheimer Apotheke. 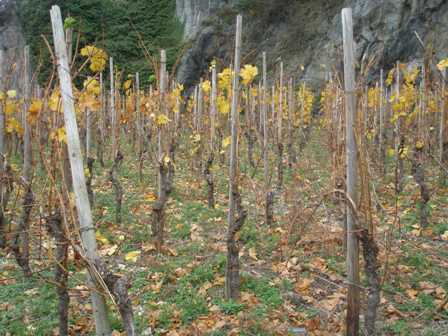 About 88% of the vines are Riesling, 10% Pinot Blanc and 2% Pinot Gris. 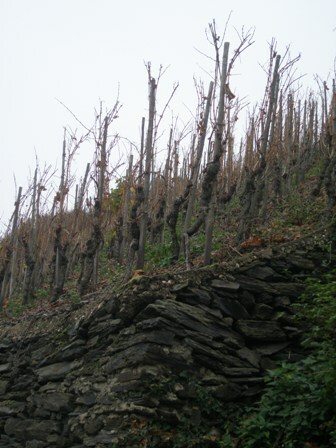 The brochure shows the steep slopes of some of the vineyards, most of them with a southern or western aspect. 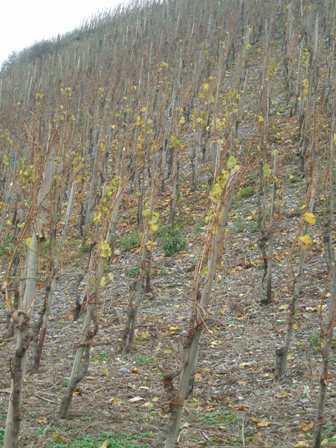 The micro climate is ideal for Riesling. 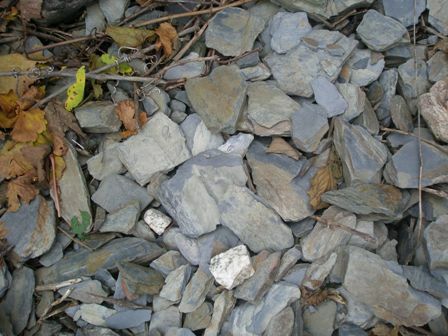 The soils consisting of red, grey and blue slate. 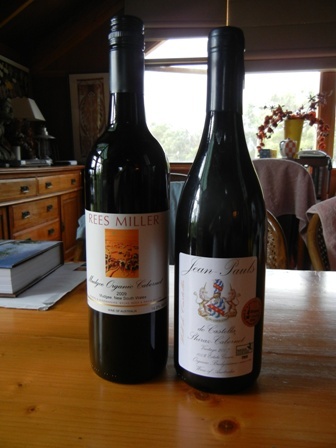 I bought a couple of the two wines I had tasted. By the way for someone like me who pays obscene prices for wine in Bangkok, these top wines were very reasonably priced, in fact they were a true bargain. It’s a pity that wine bottles are so heavy. I knew that I could only take one, maximum two of them with me on my long journey back to Thailand. What a pity, I thought. 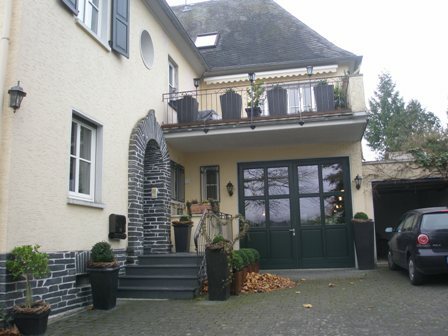 Here is another hot “secret” for your next trip to the Mosel river: Grans-Fassian Estate in Leiwen should be your destination. Trust me, you will not regret it. 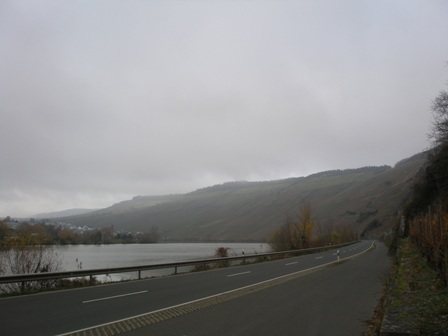 It’s beautiful to drive along the Mosel river, even in the month of November. I had this opportunity last year and thoroughly enjoyed it. 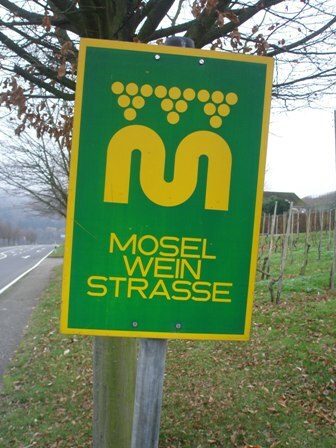 The Mosel wine route (Mosel Weinstrasse) is a fine example of a scenic drive along the vineyards and wine villages in this part of Germany which I still call home. The country I come from is just beautiful. 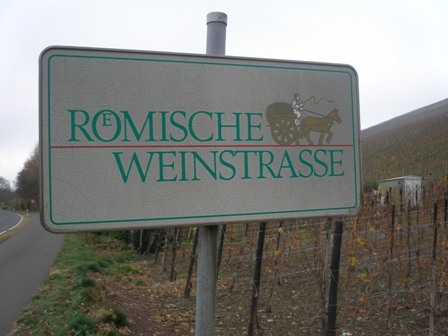 Visit the Mosel and remember the Romans did this too about 2000 years ago. Spring (and Mosel Riesling) is waiting for you. 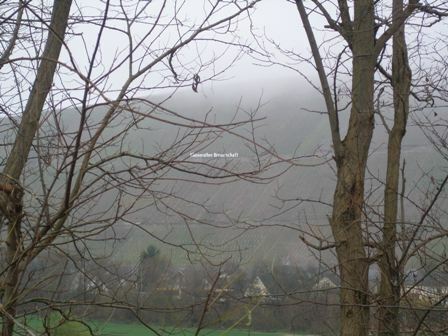 You are currently browsing the The Man from Mosel River blog archives for January, 2011.